Kebab and Skewer - Engineering Sciences & Technology Inc.
Who doesn't like a good Kebab? We offer a complete line of Kebab and skewer items for your ease of preparation, use, and consumption. Our offerings are dishwasher safe, long lasting, and are perfect for preparing those meals you like. Please view our line of sauces we use to baste Kebabs from our line of additive and preservative free sauces. Life's Good When You're Cookin Wit' Gus !!!! 15" CHROME BBQ SKEWERS, 4 PCS This is a great skewer set for grilling items over an open flame. 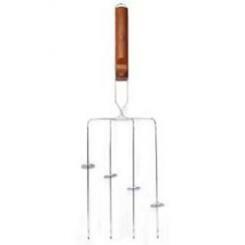 Each package contains the following: 1) 15-Inch chrome bbq skewers 2) 4-Piece set 3) Ideal for kabobs, meats and marshmallows 4) Heavy duty chrome plated steel 5) Easy to clean AVAILABLE TODAY !!!!!!!!!!!!! 10" BAMBOO SKEWERS, 100 PCS These bamboo skewers are perfect for grilled kabobs. You'll find them useful for chicken, beef, even shrimp. They are a great way to keep smaller vegetables and fruits organized for grilling as well. Pack of 100 is enough for a big get together or for many family barbeques. Perfectly sized to hold an individual portion on each skewer. 1) Simply Soak First To Keep From Burning On Grill 2) Perfect For Appetizer Skewers 3) Large Pack For Parties Or Multiple Family Dinners 4) Ideal For BBQ, Camping, Cook Outs And More 5) Great For Meat, Seafood Or Veggies Available Today !!!! Kebab's anyone? Here's a 2 PACK KIT - SINGLE NON-STICK KABOB BASKETS Long Handle For Easy On/Off Use Use this basket next time you make Kebabs and you'll be able to baste them as well. The long handle is perfect for making sure you aren't burned !!! Order Yours Today !!!!!!! DELUXE NON-STICK SHISH KABOB SET. Includes 6 Non-Stick Skewers and Frame Deluxe non-stick shish kabob set Coated with a nonstick finish, this shish kabob frame with skewers cooks kabobs in two different ways. Both slots and holes line each side of the frame. 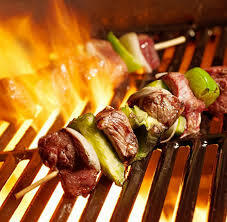 The quickest cooking method is to load the six 13-1/2-inch skewers with chunks of meat and/or vegetables, and lay them on top of the frame in the designated slots. The skewers are then rotated by hand while the frame stays in position. The second method is to insert a skewer part-way into a hole on the side, push it through the desired chunks of food, then insert the pointed tip into the hole across the frame. This way the entire frame can be flipped over at once. Measuring 13 by 10-1/4 inches when open for grilling, the frame conveniently folds in half by means of a hinge for compact storage. The nonstick finish makes clean-up easy. To ensure longevity of the finish, washing by hand is recommended. Making Kebabs? 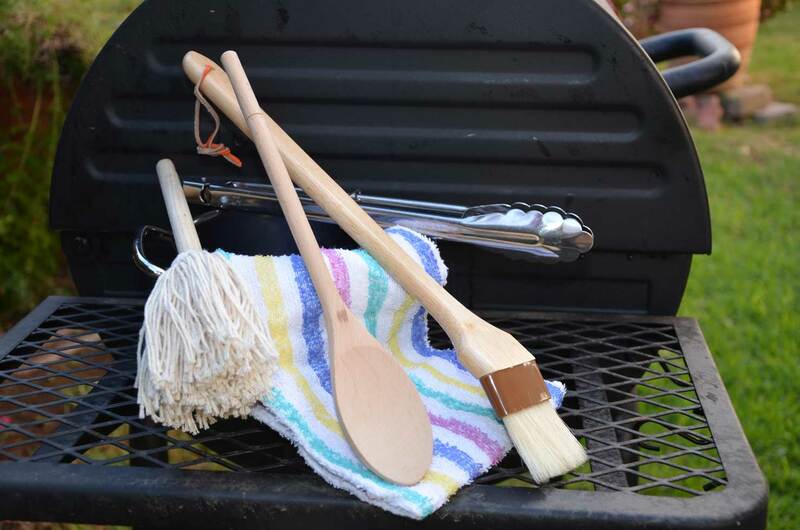 Make it easy with these double prong skewers complete with a wood handle and a push bar. They stay on the stick easier with the double prongs and you can push them off the skewer without burning your fingers. Get Yours Today !!!!! 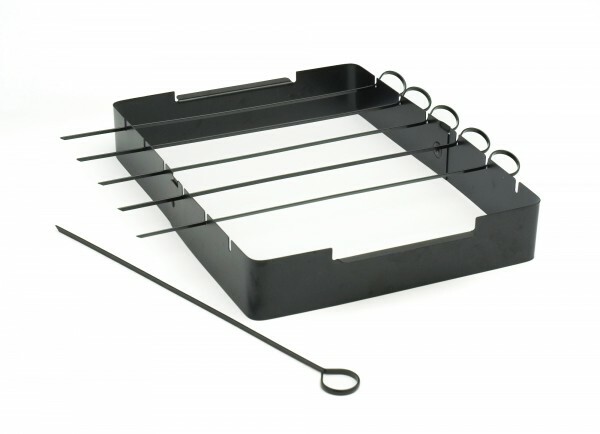 Grilling basket for 4 kabobs that includes push bar on each skewer. Comes with a patented finger grip wood handle This tool allows you the following: 1) Cook 4 kabobs at one time 2) Built-in pusher for removing cooked food 3) Perfect for meat, poultry, seafood & vegetables 4) Comfort grip handle Available for ordering today !!!!!! 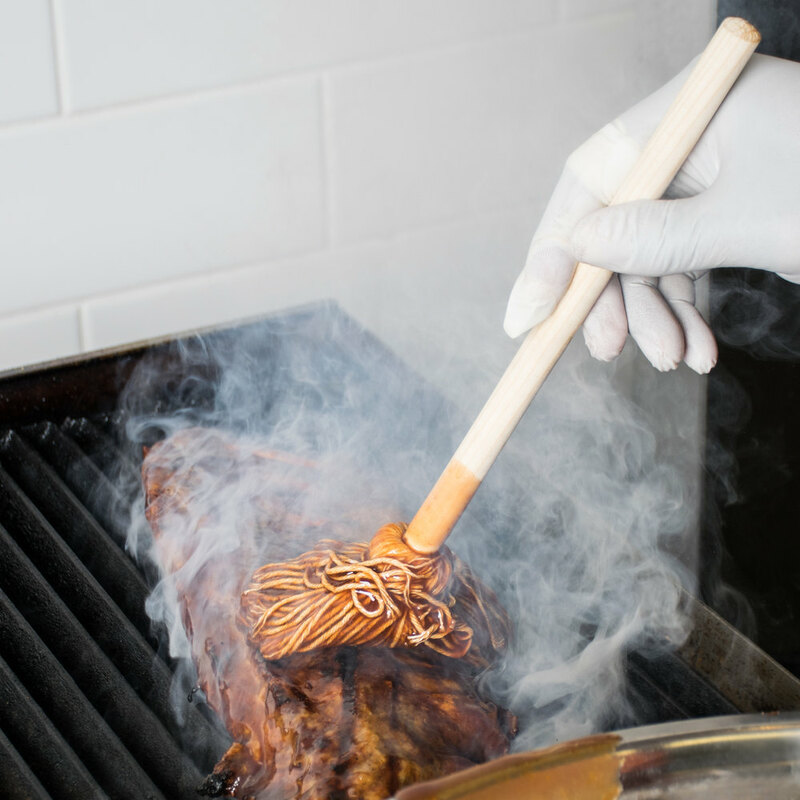 This professional quality set is perfect when you need to baste your meal before, during, and after removing it from the grill. 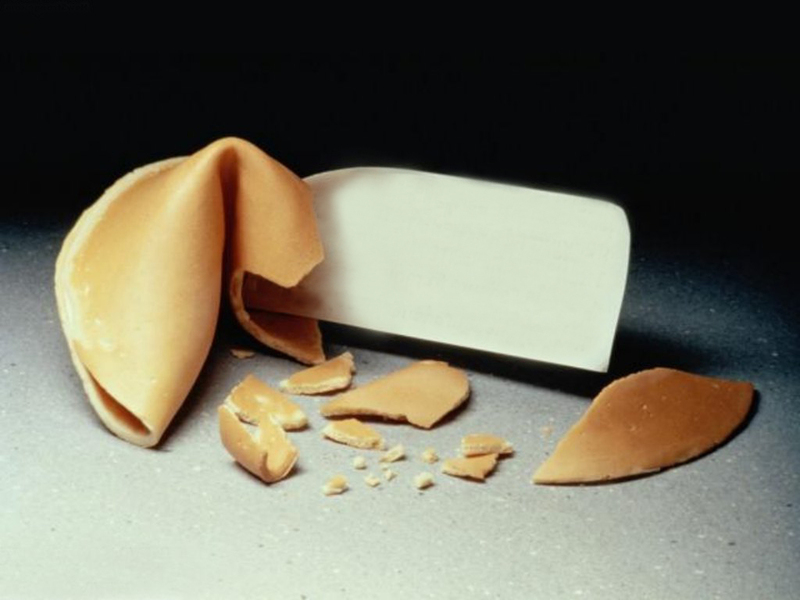 Included in this kit are the following products. 1) One quart, machine washable sauce pot 2) SlatherMaster Sauce Mop 3) 12 inch Beechwood Spoon 4) 12 inch Stainless Steel tongs 5) Basting Brush with 2 inch wide slanted head and 12 inch handle 6) Hand Towel (in case you spill) The pot is machine washable, the mop and beechwood spoon should be hand washed due to the wooden handle. Kebab loader that makes it easy to design, season, baste, and skewer kebabs. This loader has six channels where you can add each item all in one convenient place. This device allows you to prepare the kebabs before your event and store them in a convenient carrying case until you're ready for them.